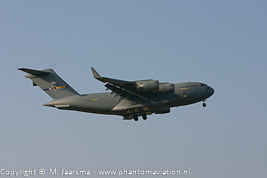 Boeing build 276 C-17s which includes one test and development aircraft (see below). 10 of these were build on own expense with Boeing expecting to find customers for these aircraft, the aircraft were referred to as 'white tails'. 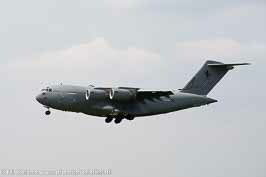 Nine aircraft were sold to Australia (2), Canada (1), Qatar (4) and United Arab Emirates (2). 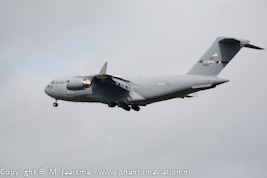 The DSCA approved a possible FMS to India for the last C-17 (opportunity) on June 26, 2017. 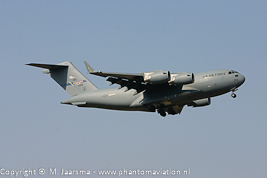 However a contract has not been signed and therefore the aircraft remains stored by Boeing in San Antonio, Texas (Kelly AFB). Country Order. Opt. Opp. Del. On Ord. W/O WFU Sold Oth. Del. LS↓ LS ↑ Act. Three aircraft were build, two static test airframes (didn't receive a USAF serial.) and one production aircraft which is included in the order and production report. 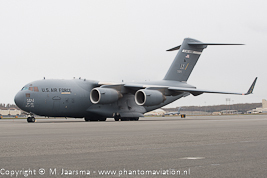 This C-17A, aircraft 87-0025 / T1, was operated by the AFMC at Edwards AFB, CA. It is now on display at the USAF museum at Wright-Patterson AFB Dayton, OH. 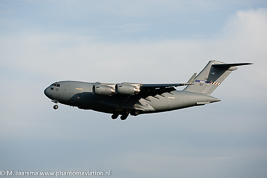 The 145th AW is in the process of converting from the C-130H Hercules to the C-17A Globemaster III. 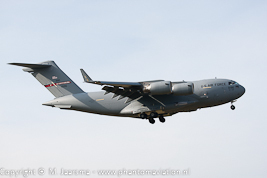 Its first C-17A should arrive in April 2018. 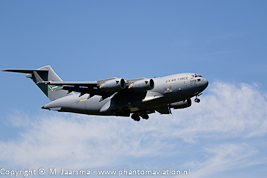 The 911th AW is in the process of converting from the C-130H Hercules to the C-17A Globemaster III. 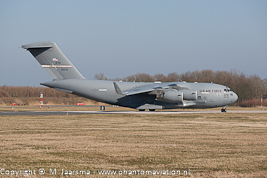 It's the latest wing to have the Globemaster assigned with its first aircraft due at Wright-Patterson in June 2018 and at its homebase from October 2018. Its C-130H Hercules should have left by the end of April 2018. Within the USAF, both active duty and reserve forces (ANG and AFRC), an associate structure is maintained. Within this structure the wings involved retain their separate organizational structure and chain of command. Based on the classic or active associate structure either the active duty (classic) or ANG / AFRC (active) wing is responsible for the aircraft (weapons system). 3rd Wing 517th AS (before active associate). PACAF. 62nd AW / 446 AW. 164th AW TN ANG. 167th AW WV ANG. 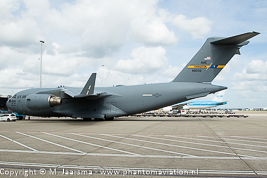 172nd AW MS ANG. AMC / AFRC. 445th AW AFRC. 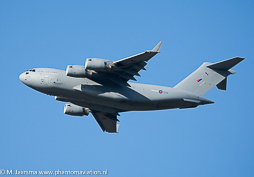 Royal Australian Air Force C-17A at Eindhoven in July 2014. 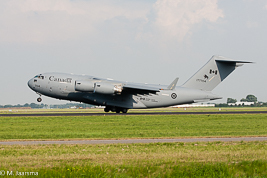 Royal Canadian Air Force C-17A departing Schiphol in July 2013. 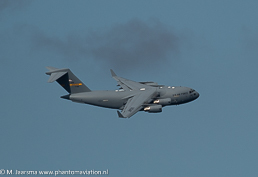 C-17s from the Heavy Airlift Wing often visit Eindhoven. April 2016. 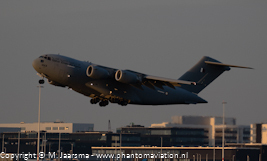 Qatar C-17A departing Schiphol on November 7, 2017 Royal Air Force Globemaster departing Schiphol March 2015 . 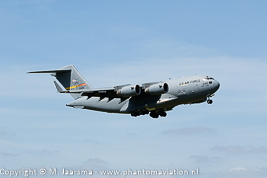 AFRC 452nd AMW C-17A arriving for the Luchtmachtdagen 2016 at Leeuwarden. 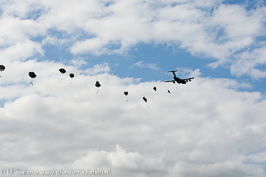 Arriving at the drop zone from the South. Green light for the para's. n the circuit to start its next run. 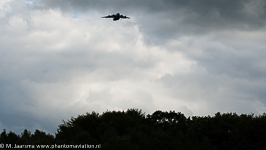 During the annual WWII operation Market Garden commemorations at the Ginkelse Heide on September 19th, 2015 an 437th Airlift Wing supported the para dropping marking first time the a C-17A Globemaster participated. 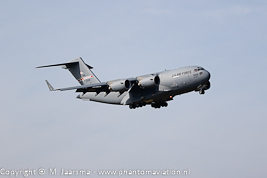 The para drop itself was the second time a C-17A flew a mission, the first one conducted by a Heavy Airlift Wing aircraft in May 2014.